Harleen Khorana working her magic behind the Kala Kendar counter. Hop To It Production’s Producer/Director Nina Beveridge and Producer/Sound Recordist/Editor Paul Hart along with Cinematographer Bongo Kolycius have had a busy year filming the Village of Dreams documentary in Toronto’s Gerrard India Bazaar. Now Paul and Nina are busy editing the film, to be aired in the summer of 2017 on TVO as a part of TVO’s Canada 150 programming strand. 2016 was a great summer of filming in Toronto’s Gerrard India Bazaar! The Village of Dreams team led by Hop To It partner and director Nina Beveridge had a memorable summer filming in Toronto’s Gerrard India Bazaar. We are grateful for the cooperation we had from everyone in the Bazaar and in particular from our main characters and their families. Sumaiyah Shah gives her sister Aysha a beautiful henna tattoo for her birthday at Forever Young Beauty Salon. 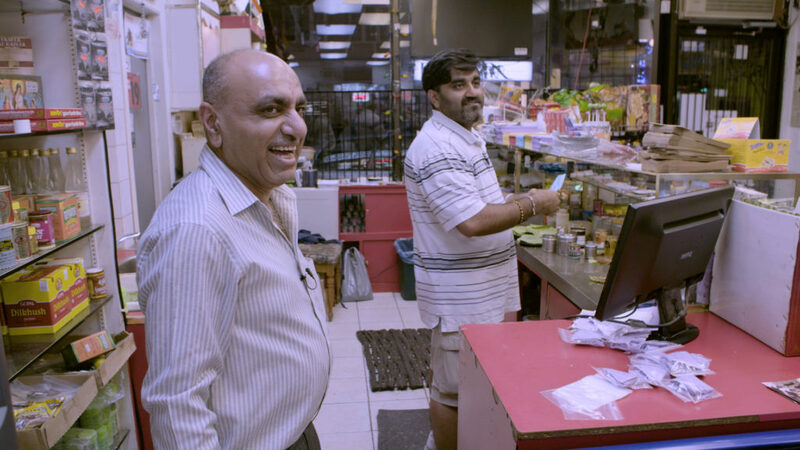 For almost 40 years South Asian culture has been the economic engine for businesses in the Gerrard India Bazaar (formerly known as “Little India”). Our goal was to explore the spirit of entrepreneurialism there, focusing on the first generation of Canadian-born South Asians and how they balance being Canadian and at the same time retain their cultural heritage. Our film follows several families who own and operate the businesses in the Bazaar, seen from the perspective of the children whose parents came to Canada in the 70’s and 80’s, worked hard and established roots. Harleen Khorana works her charm on a customer at Kaka Kendar. We filmed with Chandan Singh & family (Chandan Fashion), Gulshan Allibhai & family (Lahore Tikka House), Sumaiyah Shah & family (Forever Young Beauty Salon), Harleen Khorana & family (Kala Kendar), Ronak and Raju Diwan (Baldev Paan), Ameet Ram & family (Regency Restaurant), Ritesh Das & ensemble (Toronto Table Ensemble), Hubert Dmello and staff (Udupi Palace), Neelu Sabarwhal & family (Moti Mahal) and the Multani family (Milan Saree Emporium). Some of the scenes we filmed included a spectacular fashion show, beautiful bridal decor in the making, a bridal make-over, sizzling kitchen scenes, lots of retail shop activity, paan making, festival crowds and lots of bazaar activity, a wine and cheese tasting, and most importantly, gatherings with family and friends. We filmed a number of scenes at many other businesses in the Bazaar not mentioned above, both South Asian and non-South Asian. Over the next year, leading up to Canada’s 150th birthday, we will be creating a series of mini-documentaries for our YouTube channel and website community. All the businesses that we filmed will be represented online. We want to extend our heartfelt thanks to everyone in the Bazaar who helped us and filmed with us throughout 2016.